Micaela, Yael, Mindy, Sarah or Viviana the Jewish Roma's tour guides expert in art, Jewish history and traditions, will take you on one of the following tours. The tours are group tours and are available in English, Spanish, Hebrew and Italian. Roman Jews have been living in this neighborhood for 22 centuries, giving birth to the only Jewish community to be present always in the same place before the Diaspora. 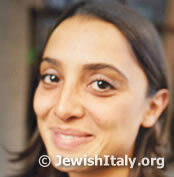 I will take you to see the Jewish Museum, The magnificent Synagogue, and the Ghetto. We�ll stop at the Kosher Bakery to taste the famous Pizza Giudia, we�ll have the chance to meet other Jews, who consider Ghetto as a meeting point. I will teach you how to speak Judaico Romanesco and how to recognize roman Jewish last names. Tour begins at the Main Synagogue. Duration 3 hours. Visit the Jewish catacombs with JewishRoma: we'll have them open exclusively for you, the tour will cover the first centuries of Jewish history of Rome, we'll visit the underground of the city, where Jews and Pagans used to be buried. You'll feel like Indiana Jones! It�s a fun and educational tour. In addition to the classic visit to the Picture Gallery, the Sculptures, the Gallery of the Candelabra, the Tapestries, the Maps, the Raphael Rooms, the Sistine Chapel and The Saint Peter Basilica (with the marvelous Piet�), we have special access to the Lapidario Ebraico, the archive of the first Roman Jews! You'll get to see sarcophagi and epitaphs of the early centuries. We add a special focus on Jewish aspects. No other tour does that!! Duration 3 hours. It was discovered in 1961 at the edge of the town, near the ancient coastline. The building was identified as a synagogue on the basis of its monumental size and the presence of Jewish artwork including a relief with a menorah, several lamps with this same motif, and an inscription which makes reference to an ark. This tour will be led by Peter, an American archaeologist who has dedicated all his life studying Roman and Etruscan sites. Duration 3 hours. The Arch of Titus (Arcus Titi) is a triumphal arch that commemorates the victory of the emperors Vespasian and Titus in Judea in 70 CE, which lead to the conquest of Jerusalem and the destruction of the Jewish temple there, and the triumphal procession the two held in Rome in 71 CE. The Jews of Rome have always refused to pass under the Arch, for centuries. When the State of Israel was born the whole community of Rome run up to the Forum to pass through the Arch, then with a different feeling. Duration 3 hours.